Having played with it some more I’ve come to appreciate that this is a really nice text editor. I like the ‘Pixelmaker’ style of the application and the Writeroom style distraction-free mode is nicely implemented. Equally impressive is the way nothing is allowed to get in the way of the text, with search panels that slide in at the bottom of the window rather than floating windows that obscure the text you are working on. Another UI element, the Navigator (MiniMap) is really useful to navigate a large file too. This is without doubt a bit of a geek’s tool. They promise TextMate compatibility and there are already quite a few plugins available, one of which the zoom plugin is particularly useful. Programming features such as bracket and quote matching are nicely implemented and the search and replace panel has regex enabled by default which really marks this as a programmer’s tool. I really like that the icon for the regex button is ‘.*’. 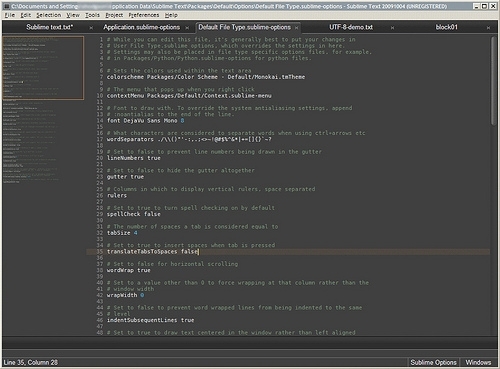 Other details that I think mark this as a serious programmer’s tool are that the toolbar is off by default and that preferences are plain text files that are edited as you would any other file, with Sublime Text itself. I’m really quite taken with this application but am not sure I love it enough to fork over $59 though. Oh, and UTF-8 files work perfectly well.